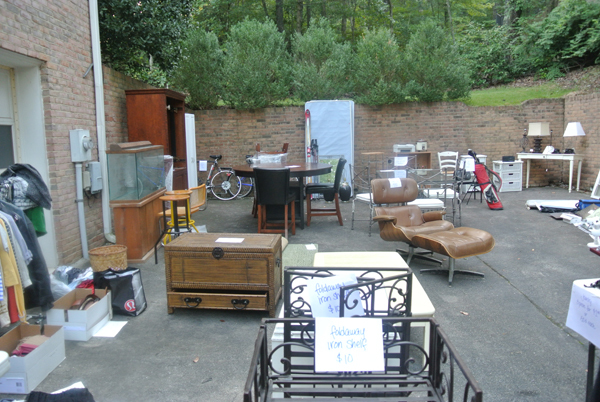 Have you ever had a Garage Sale? I swore I would NEVER do that, I had heard the nightmarish stories and generally tend to donate things when they stopped being used…But after 20 years and raising children in this house, our basement was a disaster. DD [darling daughter] felt generally responsible since most of the stuff was from her college days and recent move into a new house. 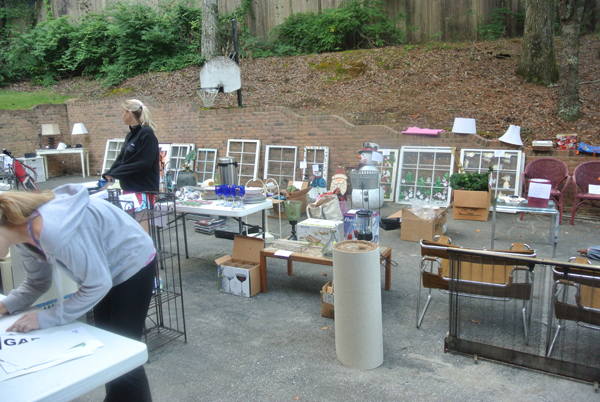 “We should have a Garage Sale!’ she said energetically, “I’ll do all the work!” No need to expound here, you know the rest of story. In her defense, she did do a lot of the work and planning and she managed to recruit her husband, brother, father, mother-in-law, one of my friend’s, her Aunt and her cousin to help us! Did I mention she is energetic? Well, we always have fun and its always an adventure and the resulting bonus is that our basement is clean and EMPTY! To reward the guys for their efforts and to keep them motivated for the next day, I invited Hungry Husband Jr, DD & Nicest Guy [my son in-law] to come over for steaks the night before the sale. 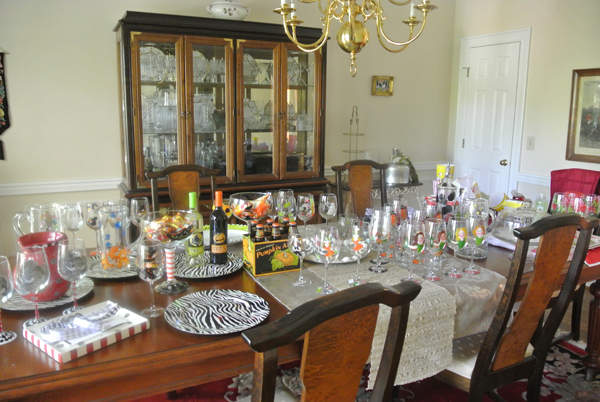 The foyer table would be perfect for our dinner for 5, especially since my dining room table currently looks like this, full of glassware and props for a show I am getting ready for in 2 weeks. 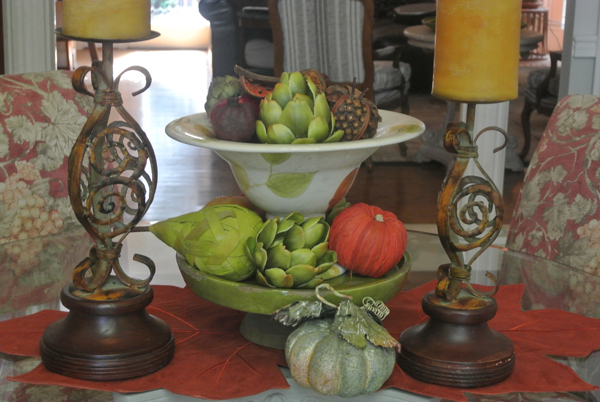 I had already done a little fall decorating… and I had some new fall things I was dying to use. 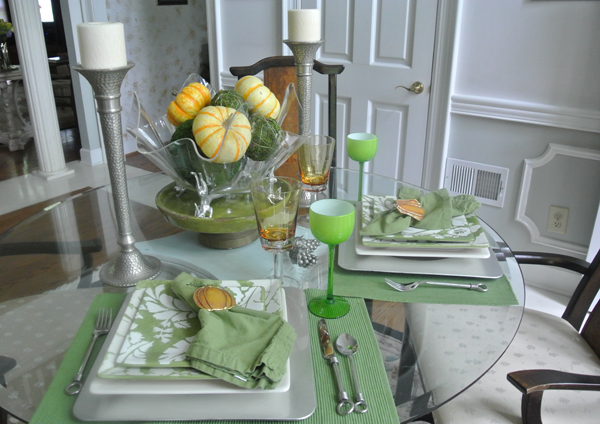 The challenge here was how to use 2 suede “leaf” placemats, 4 pumpkin napkin rings, and 4 rattan chargers. How could I make that work for 5? 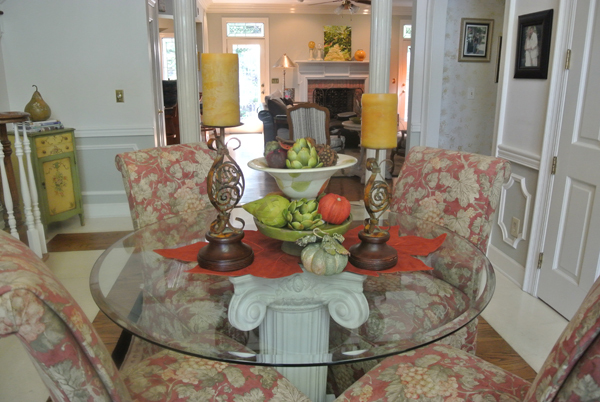 Start with what you have and pull out some pieces in your color scheme. I recently purchased these 2 placemats from Hobby Lobby $12.99 [50% off]. 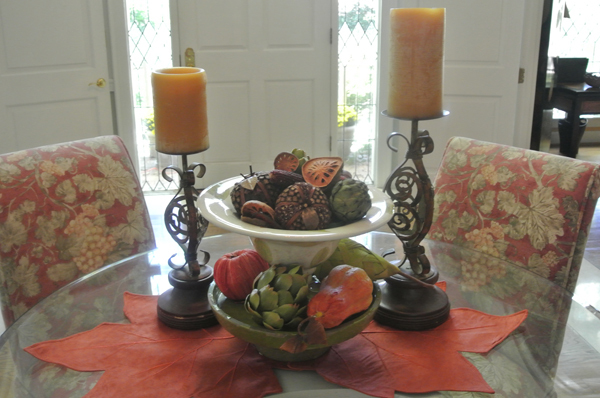 I also bought some dark brown rattan square chargers from Overstock.com. Always check that website when you’re shopping, they have GREAT deals and often offer free or minimal shipping. Believe it or not I saved these pumpkins from last year! They were perfectly fine after the season so I decided to tuck them in my china closet to see if they would last. They did! I tried to save some regular orange pie pumpkins but they started to mold and I had to toss them. 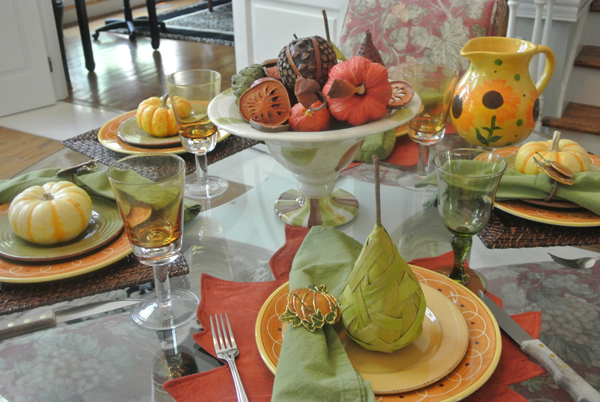 But now the first day of fall has officially arrived so I used the 3 mini pumpkins and 2 woven pears to decorate the place settings. 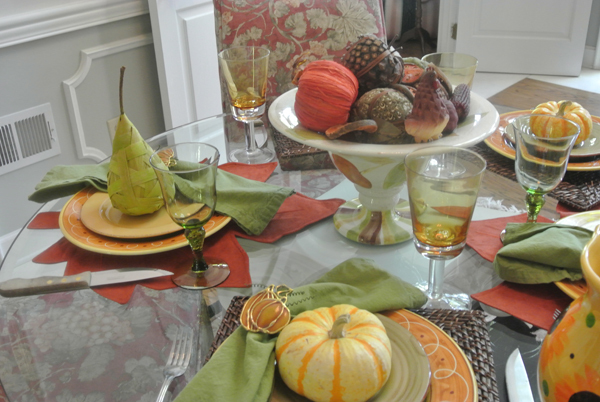 I found 3 green salad plates and 1 gold and 1 cream plain salad plate to mix and match under the pumpkins and pears. I had 3 gold goblets and mixed them with 2 green ones. 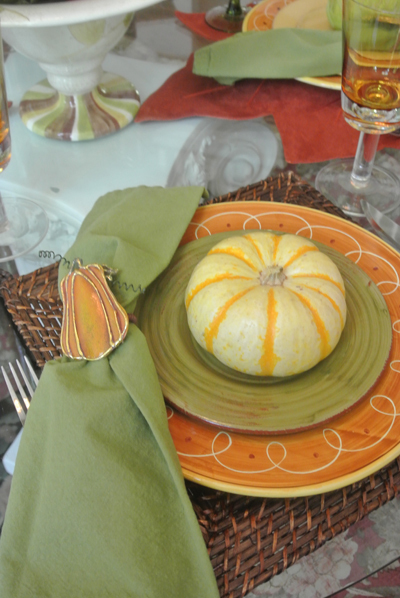 I took a dried orange slice from the centerpiece to make a mock napkin ring for the 5th napkin. 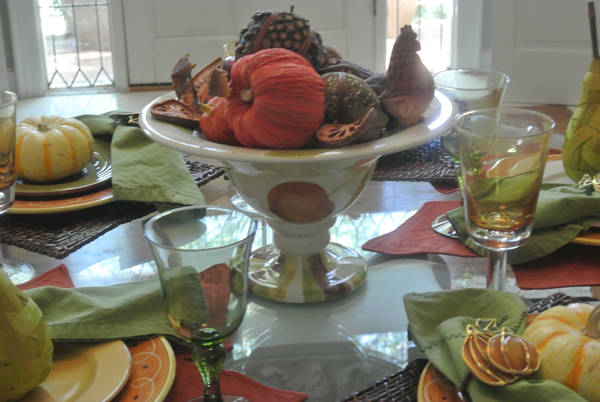 A ceramic rooster from my animal collection is overseeing the table. Because the original centerpiece was too tall for dining, I removed the green tier base to lower the compote to a better height for conversion. 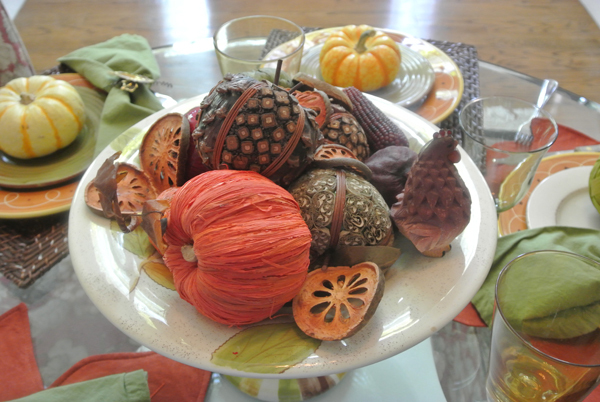 Note: in the original centerpiece I had used some plastic artichokes and wanted to mention that for company I would definitely switch these out for real ones! But for everyday, the plastic ones make sense. 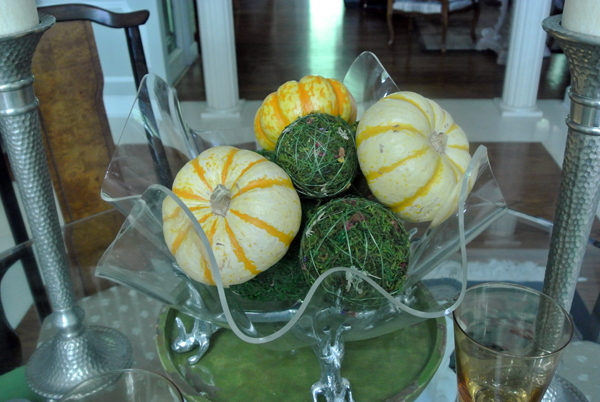 Inside the compote there is a mix of dried and crafted fruit and a straw pumpkin. After a busy afternoon doing final preparations for the “Big Garage Sale” I knew everyone would be ready for a big steak and the trimmings. 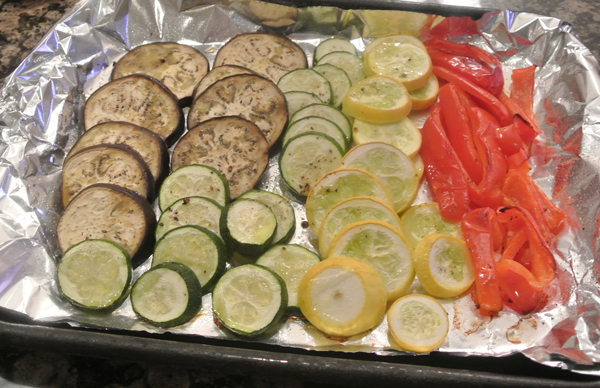 To make it easy on the sous chef [me] I loaded up on fresh vegetables from the farmer’s market and it was a simple matter of prepping them for roasting. 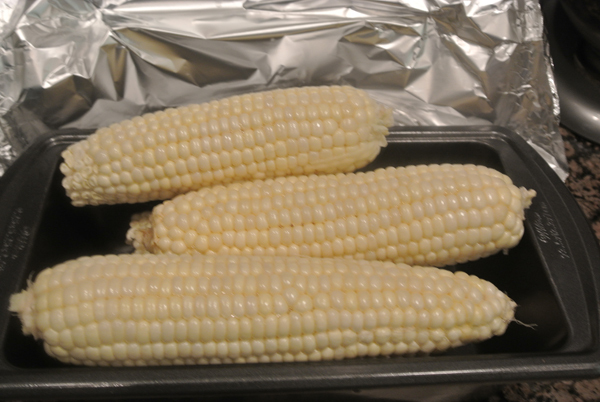 Washed veggies are sliced and put on a foil lined pan that has been sprayed with cooking oil and drizzled with Olive oil, S & P.
I shucked the corn and put it in a baking pan and covered it with foil. I used to wrap them in foil individually, but this is even easier [and less expensive than using a ton of foil]. Roasted corn has such a good flavor that butter is really optional. It is a great cooking method for a buffet service because it stays HOT a long time. 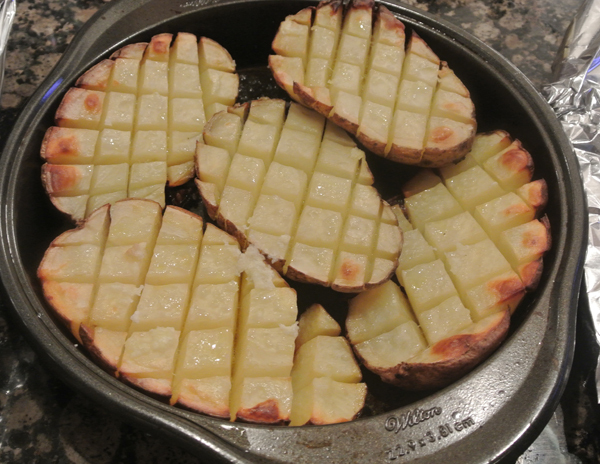 I cut large baking potatoes in half longwise and made deep diagonal scores across the cut surface of the potato. 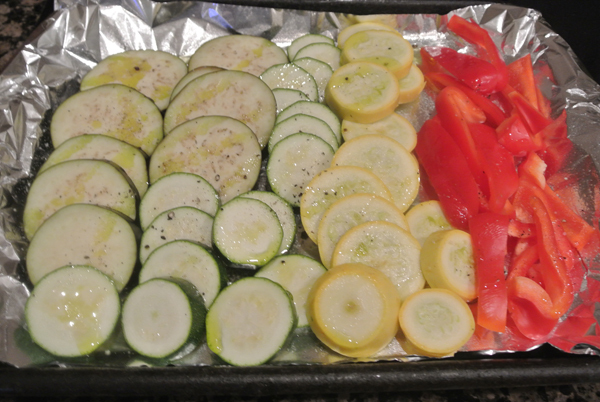 I drizzled them liberally with Olive oil, and lots of sea salt. 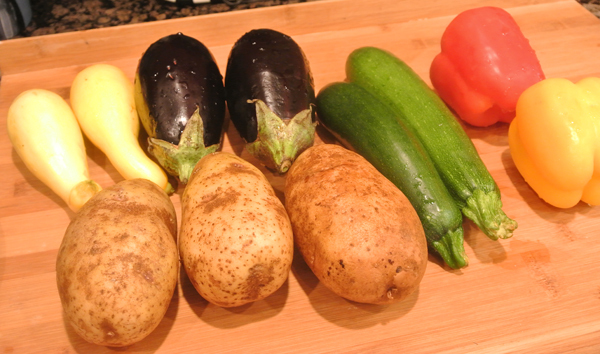 Roast the corn and potatoes for 1 hour at 400, adding the vegetables after about 30 minutes. Run the potatoes under the broiler for a few minutes if necessary, to brown. 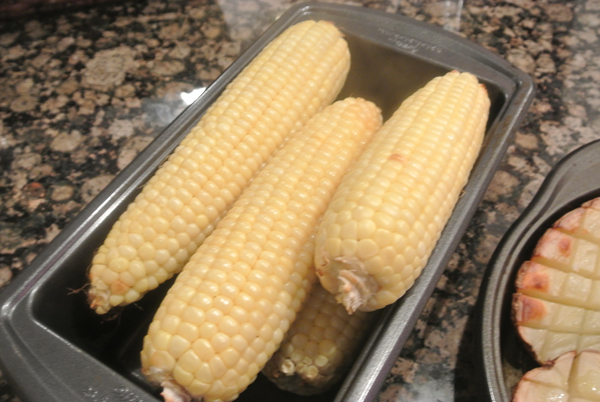 I used this narrow loaf pan for the corn so I could get everything in my oven…it worked fine, the corn didn’t care! 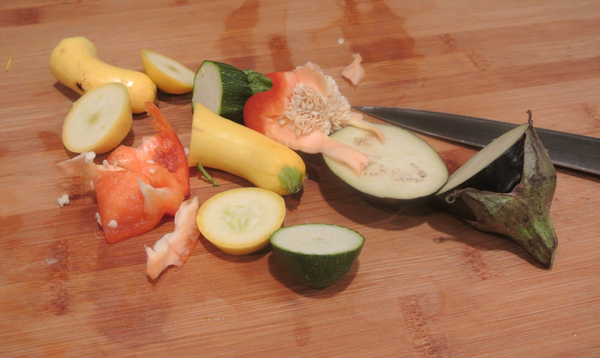 With the cooked vegetables I served some freshly shaved Parmesan cheese on the side. HHjr did a great job of cooking the steaks perfectly for everyone. 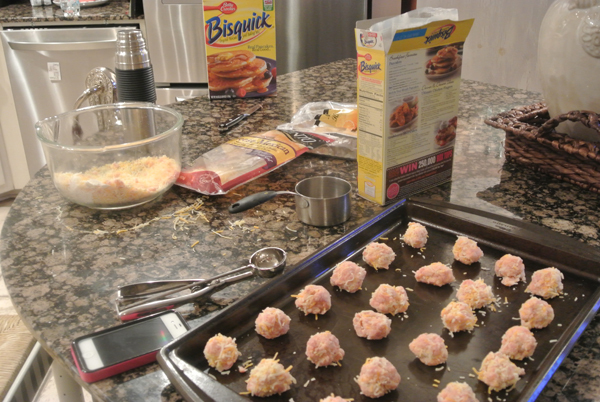 6:40 am the day of garage sale I am in the kitchen making sausage balls. REALLY. Who cooks the day of a garage sale? “Mom,” DD said to me the day before, “I think we should make something for breakfast for everyone”…aghhh…ever the entertaining hostess is DD. Did I mention she is energetic? Actually, I had thoughts of this earlier in the week, any occasion calls for food and hospitality around here…but I just hadn’t gotten around to it. Well, naturally it turned out that she didn’t have time either, and we were too tired to do it after dinner…I said I would try to do it first thing in the morning and really, it kept me away from all the last minute grunt work they were doing, so it worked out quite nicely! 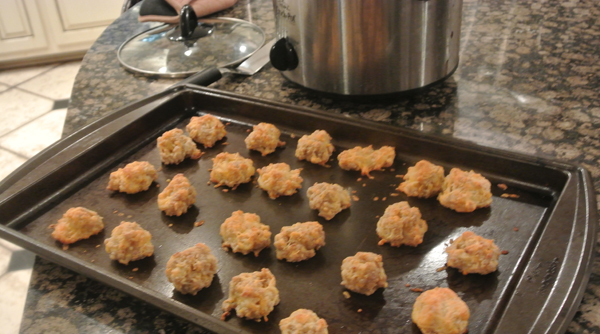 Sausage balls are ready to load into crockpot for the hungry workers. For some great sausage ball recipes check out plainchicken.com, she has some fantastic easy sausage ball recipes and many others too! 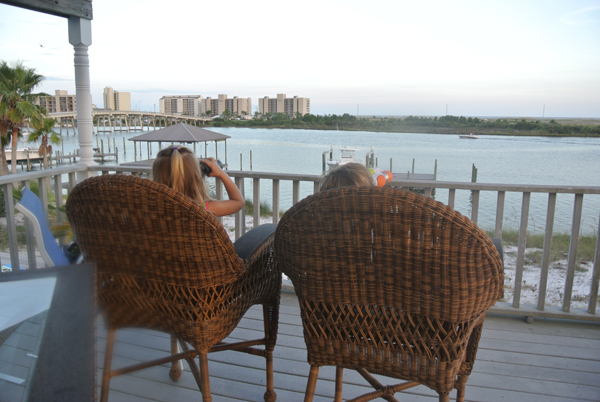 This is the view I will hopefully be looking at next weekend! [Minus the kiddos!] HH & I are getting out of town so we can rest! 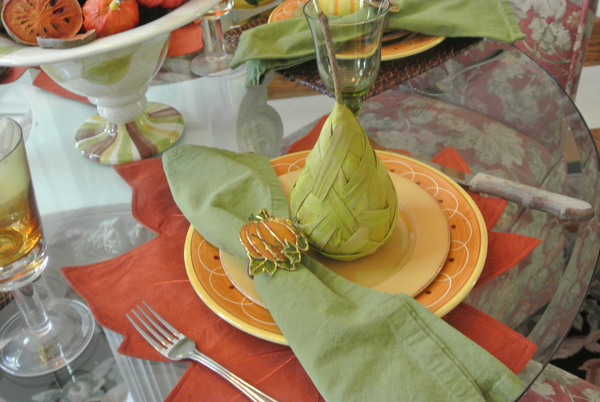 I love how you mixed the leaf placemats with the rattan chargers! When we have yard sales, my mom usually cooks cinnamon rolls for breakfast! Looks like you had a lot of merchandise to sale!! !